Females: 2.2 kg (4.8 lbs). Females: 370-408 mm (14.6-16.0 in). Plumage: Bright orange/pink; rump, head, neck, wing coverts slightly darker; black flight feathers. Beak: Sharply downcurved; lower bill thicker; numerous keratinous plates serve as filter feeding mechanism. Range: N. Caribbean (Cuba, Hispaniola, Bahamas); S. Caribbean Yukatan, N. coast of South America from Colombia to French Guiana, Venezuelan islands, Bonaire); Yucatan peninsula, Galapagos islands. Habitat: saline lagoons; muddy, shallow lakes. Migration: Generally non-migratory. Those that do, migrate between summer breeding grounds and winter feeding grounds. Activity Cycle: Feeding, preening, resting, courtship; feeding is highest right before mating season. Social Groups: Huge colonies; must be in large groups to breed. Diet: Filter invertebrates, algae, and plant material out of shallow water and mud. Predators: Racoons, marguay, jaguar, humans, birds of prey. Courtship: Group breeding displays lead to synchronous breeding; monogamous pairing for several seasons. Nest: Cone-shaped mound of mud with scooped-out top; shallow moat excavated around nest. Hatchlings: Leave nest after 5-8 days; form creches (large numbers of chicks cared for by a smal number or adults). Longevity: Unknown in the wild; have lived 40-60 years in managed care. Oldest cave painting of flamingo dated at 5000 BC, from Spain. Egyptian hieroglyphic symbol of flamingo denotes the color red. Historically confused with the legendary Phoenix. The tongue was considered a delicacy in Roman times. 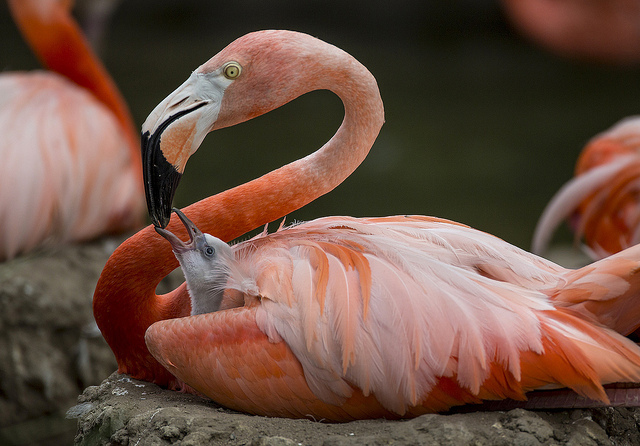 April 2003: newly renovated Flamingo Lagoon opens; flamingos start building nest within 3 days. © 2003-2016 San Diego Zoo Global. Updated 2015. Tanonomy update 2016. How to cite: American Flamingo (Pheonicopterus ruber) Fact Sheet. c2003-2016. San Diego (CA): San Diego Zoo Global; [accessed YYYY Mmm dd]. http://ielc.libguides.com/sdzg/factsheets/ americanflamingo.